MORE Gilbert H. comics – close to 300 pages! The comics collected here were originally published in the early-to-mid aughts, appearing in the second volume of Love and Rockets as well as the concurrently published Luba's Comics & Stories. Some of these comics have already been previously collected in Luba: Three Daughters and High Soft Lisp as well as the hardcover Luba omnibus. 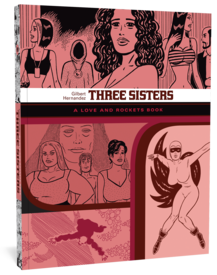 Now, here, they at last find their permanent home as the fourteenth volume in the affordable and attractive Fantagraphics uniform edition of Love and Rockets. Luba, Fritz, Pipo, Doralis, Mila and the rest have more than their fair share of ups and downs in this heartbreak soup of comics tales.